The SOMBRE PRINTEMPS "Ambient & Film Music" project by Philippe Fichot/Die Form including 2 CD (Vol.1 from 1991 Vol.2 from 2011) is now finished. It will be available on OUT OF LINE Records in June, in Digipak DVD size limited luxuary edition. A 99 copies ultra-limited edition including an original signed and numbered fine-art print is also planned. "The intriguing music project Sombre Printemps, which Philippe Fichot/Die Form created in 1991 to commemorate the German author and graphic designer Unica Z�rn (the project�s name has been taken from one of her books), is now undergoing a spectacular renaissance, 20 years after its inception. On �Ambient & Film Music II�, exceptional artist Fichot yet again takes us on a journey into playful, experimental and surreally tinged sonic worlds. Intricate grooves meet ingenious compositions, wild vocal samples and highly creative sound design in eleven tracks that invade the ears in a disturbing, yet otherworldly beautiful manner. 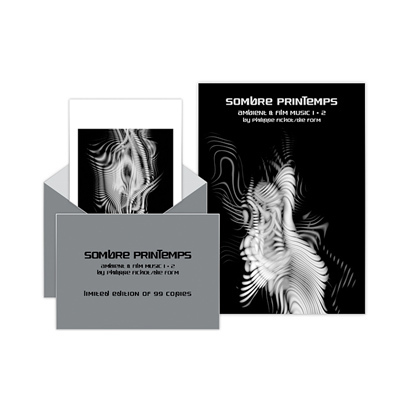 Celebrating the 20th anniversary of Sombre Printemps, the new album receives a classy double-CD-release that also includes the rare and long-deleted first release �Ambient and Film Music�, on which Philippe Fichot created aural experiments that were way ahead of their time, two decades ago. It has been way too long since the creative mind behind Die Form has last allowed us to glimpse into one of the most interesting facets of his creative oeuvre. For fans of Die Form and for aficionados of creative electronic aural art, �Ambient & Film Music II� is an absolute must!" The booklet includes 16 new photograms specially created with algorythmic mathematic composition software, directly inspired by the music.